Note from Eqs. (19-10) through (19-12) that the equatorial magnetic field components, being proportional to sin ^(«0.2), are much smaller than the component along the celestial z axis. Hence, for a satellite in an equatorial orbit, it is easier to accomplish right ascension changes than declination changes (see Eqs. (19-8) and (19-9)). where S2 is the right ascension of the ascending node and v' is the azimuth in the orbital plane of the spacecraft position vector, measured from the ascending node. Note that the x and y components are of the same order of magnitude as the z component. 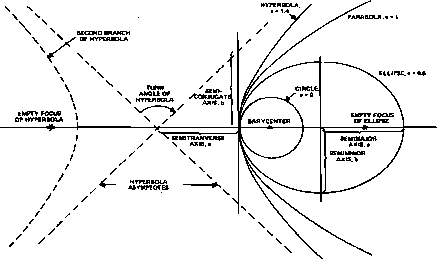 Hencc, for a satellite in a polar orbit, declination changes can be accomplished as easily as right ascension changes. For both the equatorial and the polar orbit cases, the x and y components of the geomagnetic field are oscillatory, involving angular frequencies that are combinations of twice the orbital rate (from terms involving t>'), the Earth's rotation rate (terms involving am) and the rate of change of the ascending node, R. For near-Earth satellites, the orbital period is much smaller than the Earth's rotation period (a day), whereas the ascending node completes a cycle in several weeks or months. Therefore, the dominant oscillations in the x and y components of the geomagnetic field have twice the orbital frequency. Consequently, for a given coil state u, the time rate of change of declination (Eq. (19-9)) follows an approximate sine curve, whereas only a part of the right ascension rate is oscillatory in nature (Eq. (19-8)). The general characteristics of these results are valid even when more exact models of the geomagnetic field are used and are valuable for the development of magnetic control strategies. Magnetic Control Strategies The reorientation of near-Earth satellites using a spin axis coil dates from TIROS-2 in 1960. In early missions, magnetic control potentialities could not be fully exploited because of the need for ground contact to change the coil state, u (magnitude and/or polarity of the coil current). The coil was left on for a number of orbits or days, during which time, the spin axis would precess at a very slow average rate. This mode of control is referred to as continuous torquing. The launch of TIROS-9, in January 1965, saw an innovation in magnetic control system design. Through an onboard timer, the coil polarity was switched four times per orbit. Therefore, this system was called quarter-orbit magnetic attitude control, or QOMAC. QOMAC takes advantage of the fact that the geomagnetic field oscillates with a period of approximately half the orbital period by switching coil polarity in consonance with the geomagnetic field. To allow some flexibility in maneuver planning, QOMAC hardware prpvides for control of the initial phase and polarity and the switching period. Both continuous and QOMAC torquing have been used for OSO-8. The decision as to which to use for a particular maneuver depends on whether a straight line or a square wave function best represents the desired coil state history for that maneuver. Recent spacecraft have been equipped with delayed command systems (DCSs), in which a preselected sequence of coil-state-change commands, covering an extended period of time, is loaded into an onboard memory during a station pass and is executed at the appointed times without subsequent ground contact. This provides maximum flexibility and is limited only by the size of the onboard memory. The improved precision in the timing of coil commands provides three improvements over the QOMAC method: (1) minimization of the time required to complete a maneuver, (2) minimization of the arc-length error between the desired attitude and the attitude obtainable within a specified time, and (3). minimization of the energy expended for completion of a maneuver.